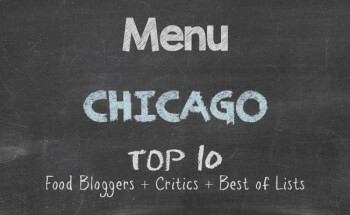 With ongoing growth in Chicago, neighbourhoods like Edgewater are becoming hubs for a lot of cultural cuisine. There is influence from the Vietnamese community just to the South in Uptown. There are several authentic Thai restaurants, Ethiopian restaurants, a nearby Nigerian restaurant, sushi bars, American cafes, and a dusting of Indian restaurants. 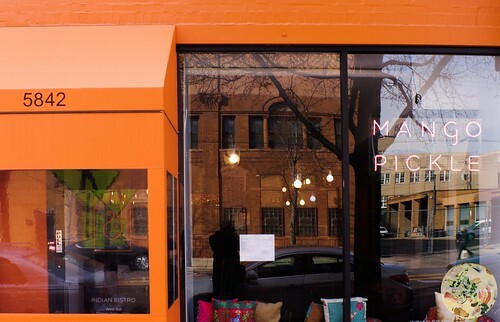 Mango Pickle at 5842 N. Broadway Street was my latest jaunt for a sampling of something representative from afar. Touted as a cafe, Mango Pickle is a spacious restaurant that serves Sunday brunch and dinner Wednesdays through Saturdays. For my first visit, I went for Sunday brunch. 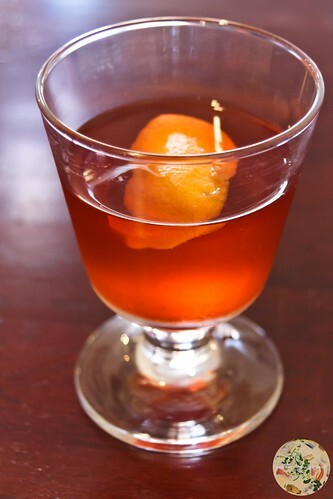 I started with a Smoky Negroni since you can never go wrong with a negroni. The bartender mixed a great brunch cocktail that was neither heavy-handed with the alcohol nor too light that it was watery. 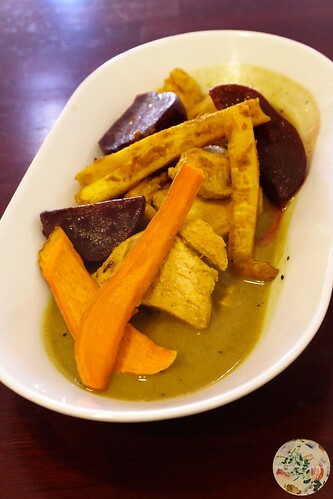 To get a good sampling of offerings, I started with chicken soup, which came in a deep plate with tender chicken and root vegetables over a curry gravy. Although I was expecting the landing to arrive in a cup or a bowl, it was still a flavourful dish that I would have again. 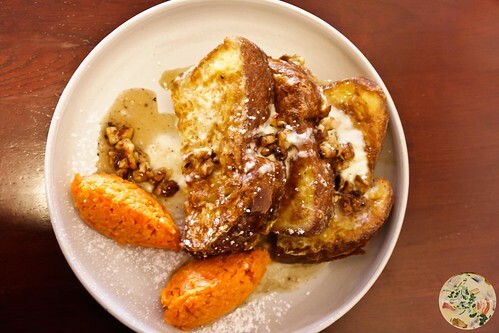 The second brunch landing was a plate of carrot halwa with French toast. Topped with pecans and drizzled with a light syrup, this was a rather light offering considering the toast had the consistency of fluffy, scrambled eggs, rather than grilled bread. The carrot halwa was the item in the dish that stood out as representative of something in Indian dining. With the natural sweetness of the halwa, it was a nice accompaniment to the toast. 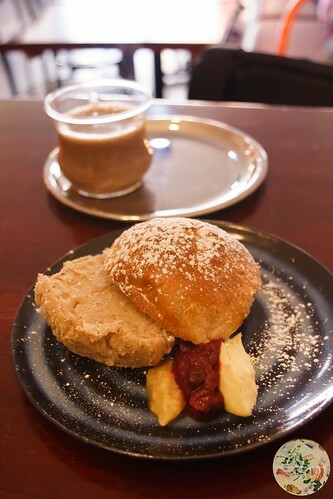 For the third brunch landing, I had bun maska with homemade jam and accompanied it with a cup of masala chai. This was the first time I had ever eaten this Maharashtrian favourite. Dusted with powdered sugar, the bun maska was warm, right from the oven, buttered, and outstanding with the jams. As to the masala chai, Mango Pickle needs a walk-up window where one can order the chai for take-away. Recognizing that the brunch seemingly had an Indian influence to American breakfast, I returned a few days later for a tasting of the dinner offerings. Very much like during Sunday brunch, the restaurant was crowded and full of energy. I was full of anticipation. I started with a cup of masala chai that came with a small vial of bourbon and another small vial of Somrus Indian liqueur. 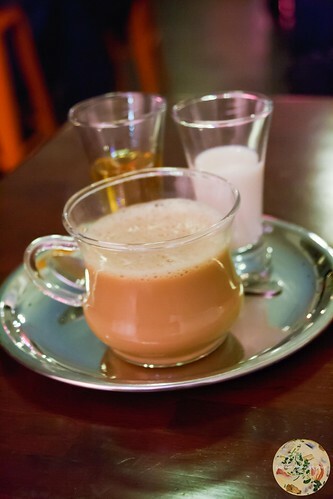 Being a fan of whiskey, scotch, and bourbon, there were no complaints while enjoying the bourbon in part with the chai. Where I was completely won over was with the Somrus Indian liqueur. Having gotten a taste of the liqueur at a media event in December 2016, I was quick to make a reminder to myself to seek out a bottle of it for enjoyment at home. As usual, I opted for a few landings so I could have a good idea of what Mango Pickle had for the dinner crowd. 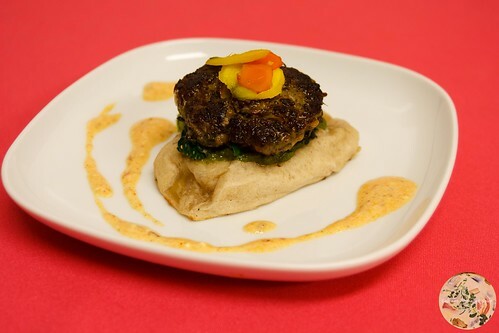 I started with a lamb slider that came open-faced atop naan and accented with a drizzle of kasundi mustard. Not a large appetizer, but certainly one that will awake the taste buds, I recommend this as a starter. 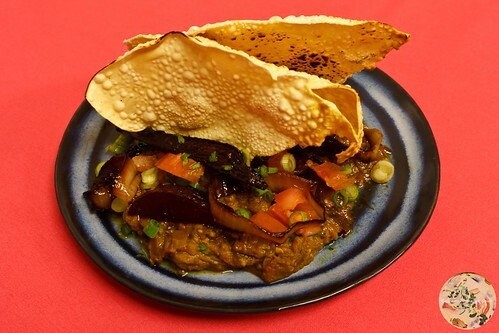 The second landing was baigan bharta, a traditional creamed eggplant dish in Indian cuisine. Spicy the way I had requested it, this was a very satisfying vegetarian option. This dish came with root vegetables and was topped with papadum. One thing I noticed with the inclusion of root vegetables (i.e., beets and sweet potatoes) is a hint of Eastern European flare sneaking into certain dishes. It works well here, for sure. The final landing was still in keeping with vegetarian options. It was chana masala. This dish had a heavier ginger base than I have had before at any Indian restaurants domestically or abroad. I ordered basmati rice with the chana masala that had herbs and two small dollops of ghee added. Fantastic. Looking back, I think naan would have tempered the ginger a bit, but the ginger was actually good for digestion given how much I had ordered. Since I often spend a lot of time in Edgewater visiting with friends, I never paid much attention to Mango Pickle on the landscape. So, I can’t say that it is a new addition to Edgewater. It is, however, a welcomed one, I’m sure. The service during Sunday brunch was superb. And during my return for dinner, the server recognized me as “the photographer who sat at the high-top.” That alone was enough to prove consistency in the service. And for the food, I’m won over completely. Even with the faint hint of Eastern European showing up in the ingredients, the restaurant serves some delicious Indian cuisine still. 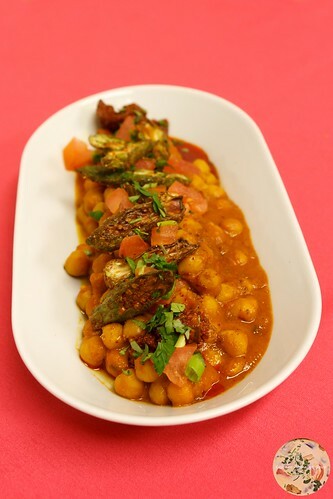 You should add Mango Pickle to your “Must Go Here” list. I like the Indian twist to the traditional brunch menu. Sounds and looks like a winner! They certainly have a winning brunch menu. And the dinner offerings are authentic. I think patrons will not only love the food, but they’ll dig the atmosphere.